SUMMARY: Tactical and operational guide to launching your own dog training business. AUDIENCE: Wannabe dog trainers or established dog trainers after some fresh ideas on marketing, class curriculum, etc. 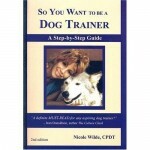 This book delivers exactly what it says on the cover: a comprehensive, detailed guide on how to set up shop as a dog trainer (and behaviour therapist). It contains an honest account of the more negative aspects of the profession, and encourages the reader to honestly assess whether they can take those on. The book is also full of great ideas and suggestions to give you that edge to your business. I very much enjoyed reading this book, and it remains one of my main references in setting up my business. Browse the Book Review archive. Genre: professional manual. Author: Wilde Nicole. Reading Level: Professional. Star: 5. Bookmark the permalink. Post a comment or leave a trackback: Trackback URL.